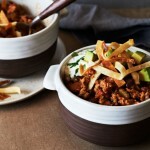 Chili, one of winters favourite comfort foods for sure. Warm up your belly without enlarging it. Make your favourite chili recipe with Turkey. It is low in fat and heart smart. Try this Chili Recipe from Turkey Farmers of Canada. In a large non-stick skillet, combine turkey, onion and garlic. Cook over medium heat 10 minutes, stirring and separating turkey as it cooks. Add celery, tomatoes, tomato paste, Worcestershire sauce, chili powder, paprika and cumin. Bring to a boil, reduce heat and simmer 20 to 25 minutes, stirring occasionally to break up tomatoes. Add kidney beans, cook 5 minutes longer to heat through. Side Tips: Make crunchy tortilla strips as a fun and tasty side for your chili: cut soft tortillas into thin strips; quickly fry strips with one Tbsp (15 mL) of oil on medium-high heat.